The Mars rover Opportunity's shadow stretches out across the rim of Endeavour Crater as the springtime sun sets over the Martian southern hemisphere. As we in the Northern Hemisphere (on Earth) enjoy the warmer days of Spring, NASA’s Mars Exploration Rover Opportunity is having a very similar springtime celebration. Whereas the onset of Spring may put us in a good mood, springtime on Mars has culminated in a very happy series of events for the tenacious rover, boosting Opportunity’s solar power output by a whopping 70 percent. Having spent over 10 years roving the Martian regolith, Opportunity has seen plenty of inclement weather that has deposited an ever-increasingly thick layer of dust across its solar panels, creating an opaque, sun-blocking coat. But twice in the past two weeks the rover has experienced "cleaning events" that have blown some of the rusty powder away, allowing more sunlight to fall on the solar arrays, giving the six-wheeled rover a seasonal power-up. Add these fortuitous events to the fact that the Martian southern hemisphere is entering spring — so the sun is rising higher above the horizon — and Opportunity is now generating over 615 watt hours of power; an increase of 70 percent when compared to the rover’s power levels two months ago. 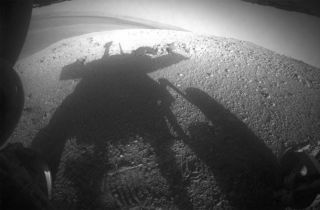 Opportunity has experienced multiple cleaning events by Marswind action that have contributed to extending the rover’s lifespan years beyond its planned lifetime of only 90 sols (Mars days) after landing on Mars in 2004. Sister rover Spirit also experienced cleaning events up to its demise in 2010. These events are caused gradually by windy weather or sudden blasts by dust devils traveling through the rover’s location. The photograph above shows the view through Opportunity’s rear hazard avoidance camera (hazcam); the McClure-Beverlin Escarpment on the western rim of Endeavour Crater is clearly seen and Opportunity’s evening shadow stretches behind. Mission managers at NASA’s Jet Propulsion Laboratory in Pasadena, Calif., are currently using the veteran rover to investigate layers of rock in that location to help us piece together how ancient Martian geology formed.